Does it irk Gene Simmons that two of his first “serious” motion pictures (RUNAWAY and WANTED: DEAD OR ALIVE) are names of Bon Jovi songs? Simmons has a small key role in the Gary Sherman-directed “actioner” WANTED: DEAD OR ALIVE. He plays the Arab villain, Malak Al Rahim, intent on causing terrorist chaos in Los Angeles seemingly for the sake of giving hero Rutger Hauer someone to pursue. No motivation on the villain’s part is the first sign that this movie smells much like working out next to a hairy-backed Middle Easterner in the gym. Blond, blue-eyed Hauer is bounty hunter Nick Randall, supposedly continuing the legacy of Steve McQueen in the TV series of the same name; he’s ex-CIA, combat-rugged and as weirdly pansexual as ever. In the grand tradition of boring screenwriting, he wants to give up the bounty hunting and settle down with his bland lady – until he is called upon by his ex-boss (Robert Guillaume) for One Last Job – to bring in Rahim, Dead Or Alive. So begins a series of vapid car chases, half-hearted fight scenes, annoying gun battles and furiously silly explosions, with intermittent perfunctory characterization which doesn’t lend any emotion to the non-chemistry between Randall and his babe, his bro or his boss. Writers Michael Patrick Goodman, Brian Taggert and director Sherman try to inject an interesting twist by having all the cops and FBI and CIA double-cross Randall. We don’t know why. And we don’t care. 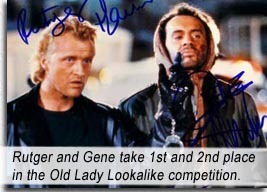 WANTED: DEAD OR ALIVE begins that drab period in Hauer’s career where we see him popping up in every piece of crap that required a blond, pansexual action hero. Strangely, the man to watch in this movie is KISS martinet Gene Simmons. He truly makes an imposing villain; he’s the tallest Arab-looking guy in the room, he doesn’t say much, and he puts that Bat Demon dead eye stare to great use. He doesn’t do anything overtly thespian – in fact, he is underused, probably because he can’t act – but since his first major outing as Tom Selleck’s nemesis in 1984’s RUNAWAY, he has learned to control his overacting stage persona, in the process creating a more sinister performance. During the boring climax when Randall is beating up Rahim, we see blood dripping from Rahim’s mouth and are instantly reminded of who Rahim is; someone well acquainted with the practice of spitting blood – the Bat Demon himself. Thankfully, KISS went back on tour, saving Gene – and us – from too many more acting outings. aka: WANTED DEAD OR ALIVE. Writers: Michael Patrick Goodman, Gary Sherman, Brian Taggert. Starring: Rutger Hauer, Gene Simmons, Robert Guillaume, Mel Harris, William Russ, Jerry Hardin, Hugh Gillin, Robert Harper, Eli Danker, Suzanne Wouk.